​​​​ FRISCO – The 162-unit, age-restricted Aspens at Wade Park community has changed hands. 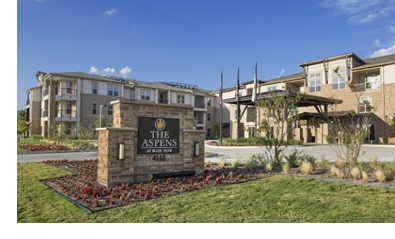 Aspens Senior Living sold the Class A property to a joint venture between The Carlyle Group and Greystar. Built in 2017, the 5.4-acre property includes amenities such as a fitness center, movie theater, salon/barber shop, library, bistro, and outdoor barbecue area.